Jack White's record label launched a turntable to near space on July 2, 2016; the craft played Carl Sagan's "A Glorious Dawn" high up in Earth's atmosphere. Singer-songwriter Jack White has taken music to new heights — literally. 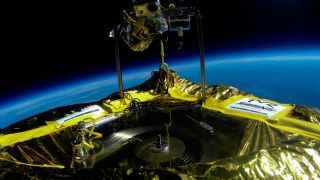 White's Third Man Records launched a turntable beneath a balloon last month, becoming the first entity to play a record high up in Earth's atmosphere. "Combining our creative impulses with those of discovery and science is our passion, and even on the scale that we are working with here, it was exhilarating to decide to do something that hasn't been done before and to work towards its completion," he added. The balloon — carrying a special "space-proof" turntable called the "Icarus Craft" — lifted off on July 2 just outside the town of Marsing, Idaho, Third Man Records representatives announced Saturday (July 30). As the record player ascended, it played Carl Sagan's "A Glorious Dawn," a collection gleaned from the late astronomer's famous "Cosmos" TV series. "It brings us great fulfillment to pay tribute to the incredible scientist and dreamer that Carl Sagan was," White said. "We hope that in meeting our goal we inspire others to dream big and start their own missions, whatever they may be." The launch celebrated Third Man's seventh anniversary, label representatives said. In addition, the copy of "A Glorious Dawn" that reached the stratosphere (a middle layer of Earth's atmosphere) was the 3 millionth record that Third Man has pressed. Third Man held viewing parties at its two locations, in Detroit and Nashville, on Saturday. These parties showed a recorded video of the launch, which had actually occurred nearly a month earlier. While "A Glorious Dawn" set a record with its recent flight, other discs have flown farther without being played. For example, NASA put copies of the Golden Record on its Voyager 1 and Voyager 2 spacecraft, which launched a few weeks apart in 1977. The Golden Record was designed to tell any intelligent aliens who happened to find Voyager 1 or Voyager 2 a little about Earth and humanity; Sagan led the team of scientists and educators who decided on its content. Voyager 1 left the solar system in August 2012, and Voyager 2 should do so soon, NASA officials have said. Both probes are more than 10 billion miles (16 billion km) from Earth.